Here are Meredani and I on Magic Island (that’s a real place) on Oahu, at the water’s edge with Diamond Head in the background. From left to right it’s me, Meredani in a traditional (original heirloom) Fijian wedding dress, flower girl Ginger whose 7th birthday happened to be May 7th also, and Kahu Jane Kaimana Ma’u. 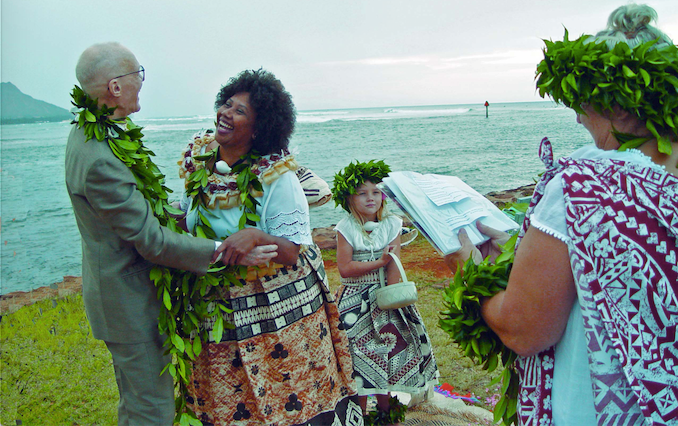 (“Kahu” is Hawaiian for “priest” or wedding official, a person carefully trained and strictly licensed by the State of Hawaii.) Kahu Jane is performing the wedding rites. 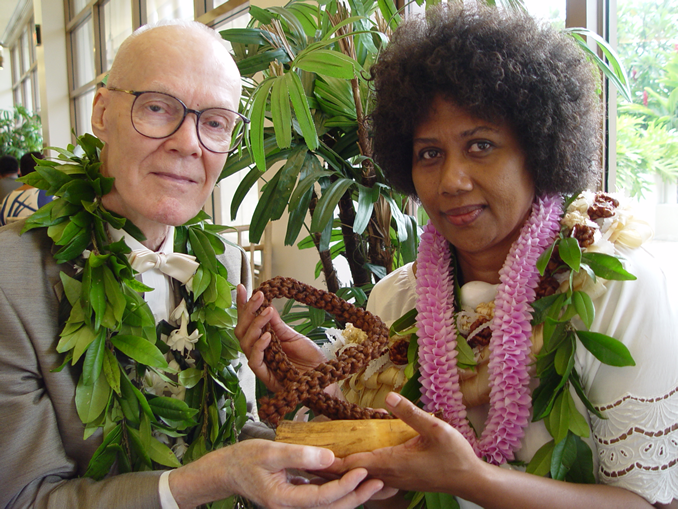 This one is Meredani and I holding a whale’s tooth; this may need some explanation. Actually more than explanation – some knowledge of Fijian culture would come in handy. You could read up on that at https://en.wikipedia.org/wiki/Tabua or on other sites about “Tabua” (ceremonial whale tooth) from Fiji. In short, whales’ teeth, which have been extremely rare since Fijian cannibal times, were kept (and traded) as a family treasure – in most cases as THE family treasure. Like a bar of gold, one whale’s tooth was owned by the entire family, revered and worshipped, and then it was passed on from generation to generation, always given to the one considered the main bearer of the family values. That whale’s tooth has its own spirit too, which is still alive, radiating energy and strength to its owner or to anyone who is exposed to it. Well, Meredani was the trusted holder of their family’s whale’s tooth, passed down through generations for hundreds of years. And then, voila, there it was as part of our wedding ceremony: that good fortune and talisman is being transferred from her to me. Only a select few had been given two weeks’ advance notice of the wedding that was going to take place. The rest of the world received no notification because it was to be a surprise wedding, a very private affair “far from the maddening crowd” and with the news only getting out afterwards. This one is from Hildegard’s longtime principal physician, and close personal friend, from when we came to Hawaii in the 1990s until the very end. WOW what a surprise !!!!!!! The BEST NEWS I have heard in a long time !!!!!!! BEST WISHES for a long long happy life together. I am positive that Hildegard is very happy to know that you are married and that she gave you her best BLESSINGS. Thank you for the delightful HAPPY NEWS. “Dragonfly” lives in Vermont, a book reviewer for Roundtable Reviews, which, by the way, has provided many book critiques for Amazon. She is the “Dragonfly” who reviewed my book “Enjoying the Ride” in 2002 and became a personal friend to both Hildegard and me. Happy birthday and my sincere congratulations! A second marriage such as yours is a testament to the love you had in the first one. I’m sure you and Meredani will be quite happy. I would have dropped in but, alas, I’m just a bit too far away. You both look very happy. Sometimes, as you know, people can and do frown upon second marriages after a long first one. My advice is to ignore them and simply cherish the time you have together. Any plans for a honeymoon? You’re probably in one of the most beautiful parts of the world, but you could do a little something to celebrate. I’m just so thrilled that you have found someone to share your life with. I just spent a delightful evening reading your Superb Seniors and sitting back to contemplate your thoughts and words at the end of each segment. I want to tell you that as I am now venturing into those upper age brackets, not only do I agree with every single word you wrote, but you describe the path I have chosen to take as I age —one I feel strongly it is the right path for me. I love the feeling of trying new things, learning new things, meeting new interesting people. As I tell my family, I feel like I’m just getting started! I am so happy for you and Meredani (I hope I have spelled her name correctly.) I believe the age difference between you is very probably a nourishing factor in your marriage where you are learning from one another. I know your spirit and I know she must be so happy in the equal partnership the two of you share. Aloha and congratulations Win and Magic Mary…. Hope You both become a great team sharing life together. I know Mary for 10 years and she is the greatest person I know with the biggest heart. Life is a long adventure with new and exciting people and places to know and enjoy exploring together. Best of success ,heath and happiness to you both. The sky’s the limit. ..enjoy your new wonderful life together.